This morning, after walking the boys to school, I came home and sat and listened to the silence. I was still feeling sleepy – both boys had been up through the night, and then somewhere nearby a screech owl had been calling. So this morning, I had a lovely feeling of sinking into the silence. Our house can be so noisy when both boys are in full, loud, little-boy mode. It’s nice to rest your ears, from time-to-time. I love quiet moments – in films, in conversations, in music. Of course, there’s no such thing as real silence in our life, and the more I listened the more I heard. Our house it attached, and I could hear small sounds from our only neighbors, two stories up. We live on one of the few big streets in town, and it was as close to rush hour as we get around here. (Which is more likely to mean lots of dogs walking by, than lots of traffic.) Our house is old, it creaks; the birds sing outside; appliances hum; people call to one another out on the street. If you’ve ever made a film, you’re familiar with the noisiness of rooms, because you’ve recorded “room tone.” You’ve recorded the noises that each room makes. And these noises fill in the wordless moments of the film, because pure silence would be shocking. It would seem unnatural, and you’d know you were watching a movie. A fact Godard demonstrates delightfully in Bande a Part. You can’t really tell from this clip, but it’s a beautiful scene. And maybe, sitting in the cafe with Anna Karina, at the next table, perhaps, somebody was eating these Galettes du vexin. These little cakes are like a moment of silence in the teeming dessert section of my french cookbook. In a chapter filled with sugar and butter and icing and creams and cookies and jams and rum, these are barely sweet enough to be called dessert. 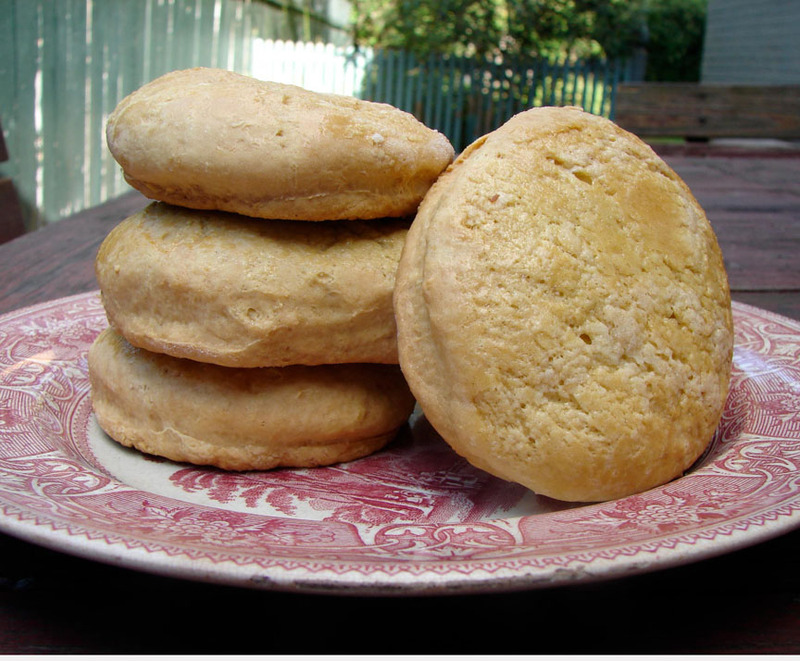 They’re more like buttermilk biscuits! Or even scones. They contain creme fraiche, which is lovely, and was very fun and easy to make. I was smitten with its beautifully creamy appearance. The little cakes are tender and mild. They seem very simple, but they have a distinctive flavor, if you take the time to discern it. It’s like listening to the silence! The more you pay attention, the more you notice. Here’s Anna Karina singing La Vie est Magnifique. Mix the buttermilk and creme fraiche in a large bowl. Add the sugar, salt and baking soda and stir well. Add the flour – start with a cup and a half, and add just enough to make a soft but workable dough. Knead as little as possible, and roll out on a well-floured surface to be about 1 centimeter thick. Using a drinking glass with an edge of 4 or 5 inches, cut out thick rounds. Place these on a buttered baking sheet. Collect the scraps, roll again, and cut out more circles. Brush each circle gently with beaten egg, and sprinkle each with sugar. Bake for 25 – 30 minutes, until well-browned on both sides. Let cool, then eat. This entry was posted in cake, recipe, Uncategorized and tagged biscuit, buttermilk, creme fraiche, french cake a week, plain cake, scone by Claire. Bookmark the permalink.